Winners are grinners – especially when they win a tasty beverage. Now, I didn’t win this bottle of Behemoth Brewing’s Tasty Beverage Extra Pale Ale per se, but one of my pub-quiz team mates did and she gifted it to me. So I feel like a winner (we also won the pub quiz, by the way) and I’ve got a new best friend – thanks Vedika! The bottle: The Behemoth Brewing monster mascot is dressed like Jules Winnfield (Samuel L. Jackson) from the cinematic masterpiece Pulp Fiction, which should have won the Oscar for Best Picture in 1995. Don’t even get me started listing the ways that movie is far superior to the mawkish Forrest Bloody Gump. But we’re here to talk about beer – not movies – so let’s get on with the review, shall we? Blurb on the bottle: From the highest king to the lowliest peasant, who doesn’t enjoy a tasty beverage? This particular tasty beverage combines a big kahuna combo of US and NZ hops to deliver juicy citrus flavours and aromas. Why not use this tasty beverage to wash down a tasty burger, or to wash down the last tasty beverage you just consumed? Taste test: There’s no false advertising here. Tasty Beverage is tasty by name and nature, with a remarkably strong flavour for just for 4.5% ABV. I can taste hints of grapefruit and mandarin, with a warm caramel edge. It’s more bitter than sweet, though, with a strong aroma that belies its session beer pedigree. Although I drank it straight from the bottle, I think it would have been better in a glass – just to let it breathe a bit. Is it the best beer ever? I’m loving the extra pale ales right now, and this marks two beers in a row now that have packed a surprising amount of flavour into a sessionable body (check out my review of Tuatara’s Outrigger Pacific Pale Ale). It goes to show you don’t need huge amounts of alcohol to make a good beer. 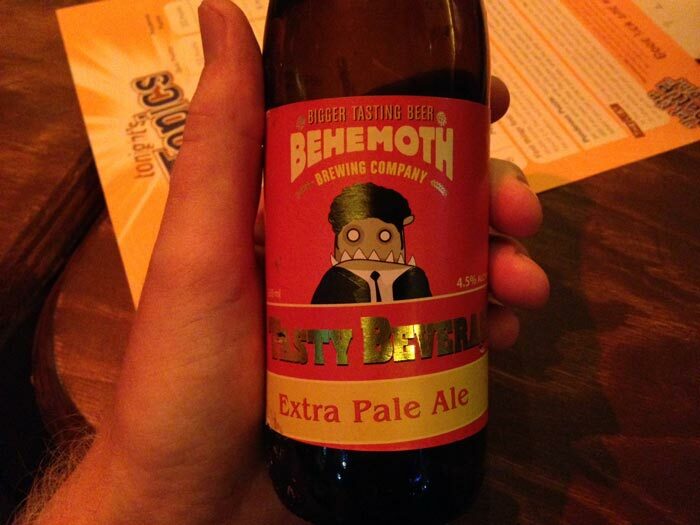 As for the craft beer on review, well, Behemoth Tasty Beverage Extra Pale Ale is one very tasty bevvy indeed. Behemoth, like me at this week’s pub quiz, is onto a winner here. Also check out: Panhead Quickchange XPA, which is another excellent extra-pale ale that puts a “big hop engine on a stripped down malt chassis”.